Sorry, Han Solo and Mr. Sulu. Based on everything we know right now, you’ll never be able to punch a button and travel through “hyperspace,” or go to warp speed. Traveling faster than light is almost certainly impossible. According to scientists, the only way you could personally visit other stars is by taking a long, long nap. 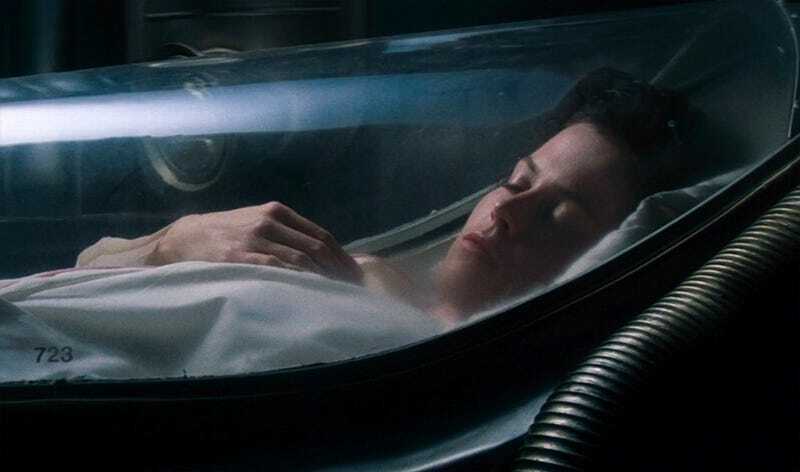 The idea of cryogenic suspension, or cryosleep, has always been one of the markers of “hard” science fiction. Instead of hand-waving some way to cheat Einstein, movies like Alien and authors like Alastair Reynolds have shown people going to sleep and waking up months, years, or even centuries later, in another part of the universe. I’ve always been a little bit skeptical about the idea of being able to freeze someone for months or years, or any other ways to slow metabolic functions enough to allow a person to wake up—no older and none the worse for wear—years later. It’s a pretty huge leap from what we know about hibernation among mammals on Earth. But after talking to a ton of scientists and science fiction authors, including Reynolds himself, I’m convinced: Cryosleep is the only hope we have of making an interstellar journey in a single liftetime. Cryosleep involves huge challenges that we have no idea how to get around—but we already know that traveling faster-than-light (FTL) is plain impossible. “Based on what we now know, FTL is either impossible, or would require energies that are flat out ridiculous. Storing brains for a long period of time is merely very, very hard,” said Terry Johnson, a biology professor at UC Berkeley who wrote the Ask a Biogeek column for io9 and also co-wrote the book How to Defeat Your Own Clone. Even a tantalizing idea such as the Alcubierre drive, a concept for a faster-than-light engine that NASA has been researching for years, “requires an impossible substance with negative mass to run it,” said Schroeder. But wait... what about wormholes? Wormholes basically tunnel from one part of spacetime to another, allowing us to leap across unimaginable distances. But wormholes may actually be impossible too, according to Dave Goldberg, a physicist at Drexel University who used to write io9's “Ask a Physicist” column and also wrote the book The Universe in the Rearview Mirror. The laws of the universe may not actually allow wormholes to exist, at least not in a form that we could take advantage of. And even if we could keep a wormhole open once we had opened one, there’s no theory as to how we would create one in the first place. The whole idea of a wormhole requires punching a hole in spacetime, after all. There is some speculation that at the tiniest scales—or “about 10^20 times smaller than an atomic nucleus”—space creates natural wormhole-like structures, we don’t actually know that for sure yet. To figure that out, we’d require a working theory of quantum gravity, which we haven’t got yet. And even if we could open up a microscopic wormhole, we have no clue how we would go about inflating it to the size of a spaceship. Of course, you can’t prove a negative—so we can’t know for sure that traveling via wormholes would be impossible. “So I’ll concede that a wormhole might be physically possible, at which point it would just be practically impossible, requiring enormous amounts of energy and engineering,” said Goldberg. Plus even if we somehow pulled it off, you’d have to travel the “long way” to your destination star, to set up the other end of the short cut. So if we can’t magically travel faster than light, or build a large wormhole, then getting to other star systems is going to take a long, long time. Here’s a pretty good rundown of just how long it would take to reach our nearest star, Proxima Centauri, with propulsion methods that we currently know are possible. Estimates range from 81,000 years (yikes!) to a mere 1,000 years. There are a few potentially faster methods—but they involve huge logistical nightmares. “If faster-than-light travel is even possible, there will almost certainly be only one way to do it, and that way may not be accessible by any human technology,” said Schroeder. But meanwhile, “we can sketch many different engineering solutions for cold sleep.” Schroeder has put a lot of thought into this topic: his novel Lockstep is all about a space empire that’s based on people hibernating for thousands of years and then all waking up at the same time. So Schroeder is optimistic that we’ll figure out how to sleep for the long periods of time required for space travel—he’s just not sure how we’ll do it. “There are many different paths to long-term hibernation. We already know that living things can be revived unharmed after very long periods.” For instance, microscopic “water bears,” or tardigrades, can sleep for up to 30 years and then be revived without any harm. Reynolds pointed out that NASA has been spending more time lately looking into the idea of using hibernation, or “torpor.” “I heard something about this only a week or two ago, but it’s been bubbling under for a while,” he said. The tricky part, according to Drew? Figuring out how to freeze and thaw the human body without causing immense damage. “Even a ground squirrel that cools to around freezing doesn’t stay there for more than three weeks,” she said. “Mammalian tissues cannot freeze without bursting cells.” Basically, when mammalian cells are frozen, ice crystals form inside the cells, causing damage to cell membranes. And even if you manage to overcome the effects of freezing and thawing without casing cell damage—and that’s a big if—you still have other problems. The other option is to engineer hardier human-like minds—via artificial consciousness, or cyborgs, or finding some way to engineer “neural-like networks that age better than ours,” said Johnson. Schroeder offered a few different ways we might be able to cope with the problems of cell damage and brain damage. We could genetically alter space travelers—for example, giving humans cell walls like plants. We could perform a drastic medical intervention, like infusing a person’s cells with sugar as an “antifreeze.” Or we could replace the cells altogether, with nanotechnology or artificial organs. We could also upload people’s minds and store them digitally, then load them into new bodies when they reach the destination. The bottom line is that putting people to sleep for centuries involves massive challenges that we have no real solution for right now. But at least it’s not actually impossible according to all the laws of physics.